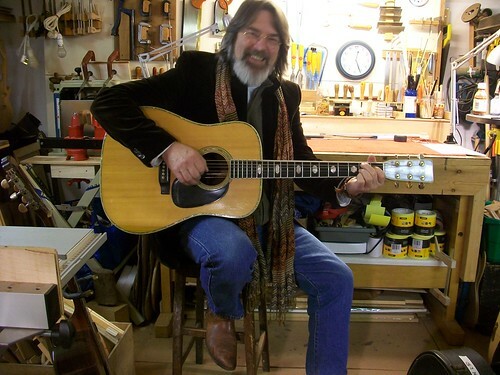 This Martin D 41 is in the workshop because the action needs lowering. The action is making it difficult to play above the 5th fret. It’s a vintage guitar made in 1972 and is in very good condition, it has a few bumps and knocks that you would expect from a guitar of this age. Its finish is lacquer checked and cracked in that desirable old vintage way (hasn’t shown up too well in the photos). During a Workbench Assessment it is concluded that there is no adjustment left in the Bridge Saddle height. It has probably been adjusted over the years until there is no more height available to removed. To understand how the action on an acoustic guitar can become higher over time we need to go back and look at its design and manufacture. Flat-top acoustic guitars such as this Martin D41 are designed as a straight-line in the horizontal plane. To explain that a little more clearly; it’s a straight-line from the line of the neck onto the soundboard, as seen from the player’s view of the guitar. 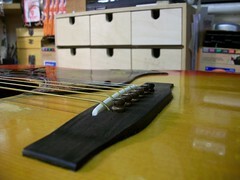 The fingerboard and bridge are then added to the design. 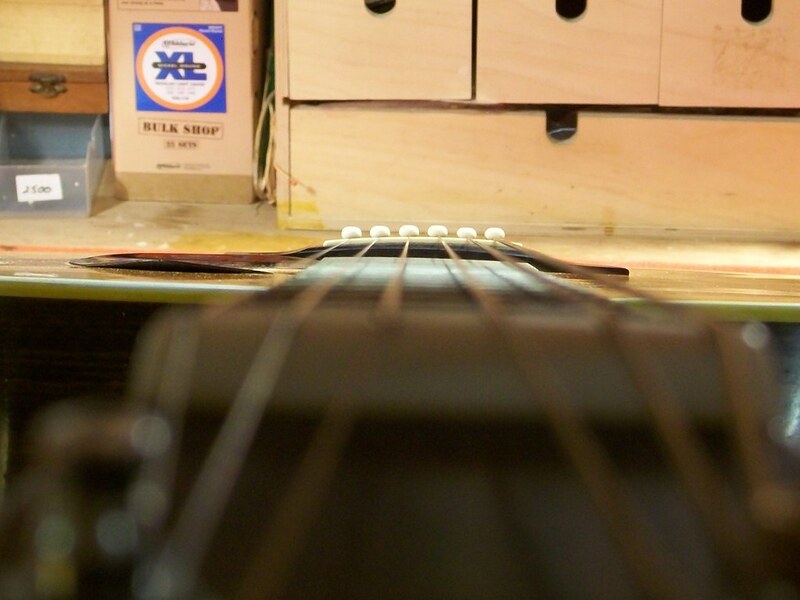 Ideally with the truss-rod set correctly the string line will start at the nut and show an approximate gap of .011″ between the first fret and the underside of the string (bass E) and then gently slope upward to show an approximate gap of .075″ above the 12th fret and then on to strike the saddle at a good height. These measurements are approximations and will differ from guitar to guitar. However, after some time things change. Due to constant string tension, humidity and temperature changes this straight-line ideal between neck and soundboard starts to distort. This could happen 1 year or 50 years after manufacture. Over time the bridge area of the soundboard begins to rise up and the area of soundboard at the upper bout begins to sink. Our theoretical straight-line acquires a shallow indentation. The end result is a high playing action. 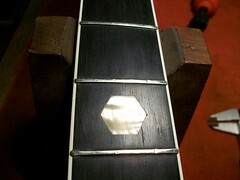 The quick-fix remedy is to lower the action at the saddle to allow the string action to be playable again. This adjustment has only a limited availability. After several adjustments the saddle becomes too low, as this photo of the D 41 on the right indicates. On some budget acoustic guitars, the top of the bridge can be skimmed and lowered to allow for more saddle to be exposed. This will permit further adjustments to the saddle height to be made. This method is not ideal but can be the only solution. 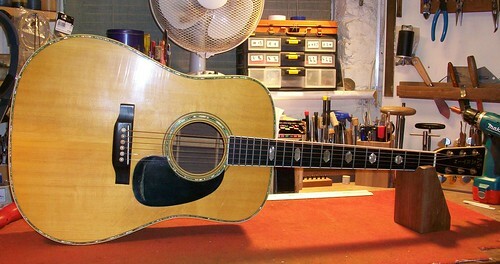 On more valuable or vintage guitars a neck re-set is the only option. How do I know when a neck re-set is needed? 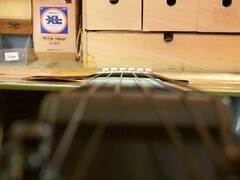 Sight down the fingerboard of the guitar from the headstock end. Look at the line of the fingerboard. 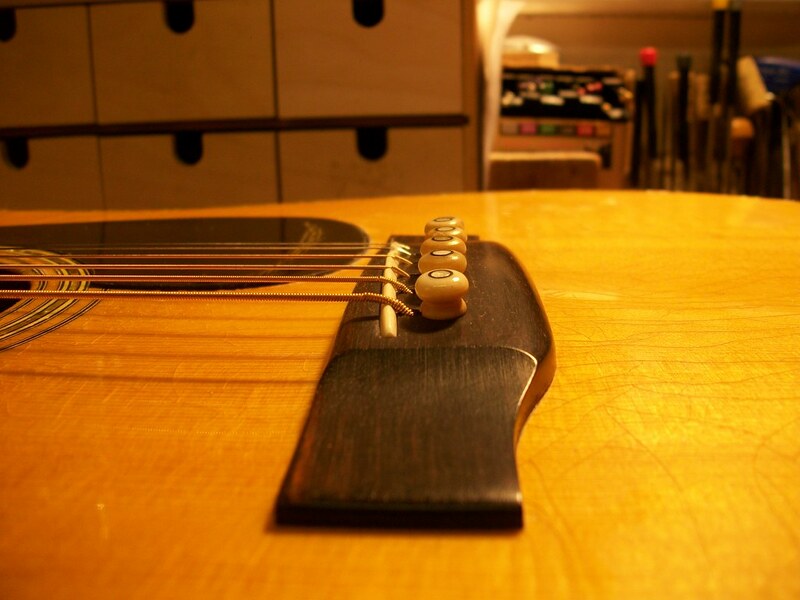 If your sight-line strikes a point under the bridge saddle your guitar could need a neck re-set. How is a neck re-set? This short video clip shows the neck reset of this D 41. 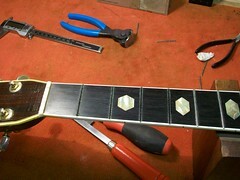 All that remains to be done on this D 41 is to replace the first 4 frets. They look a little worse for wear and would probably impede the set up of the guitar. The guitar is strung up with 12 – 53 gauge string, it sounds and plays fantastic.